Olivia at Liv To Teach is having a super GIVEAWAY. She has 75 products to give to educators. Due to having so many products to give out, Olivia has broken down the prizes into 5 separate giveaways. 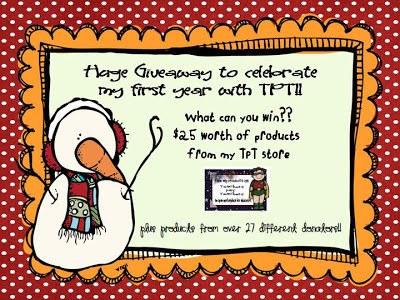 My product is in Giveaway #4 for preschool, kindergarten, and 1st grade. To learn more about my product, click on the picture directly above. To see all the prizes and to enter the giveaway, click on the top picture. Kids love learning about animals. Do you need some activities and resources for a study of REPTILES. Here are a few that I gathered up from this blog that will help you get started. Just click on the links below that match the pictures. Have fun teaching and learning new facts about reptiles. Labels: Fun Reptile Activities, Reptile Crafts, What Are Reptiles? HERE is another Teacher Resource Giveaway! This one is sponsored by Buzz Three Times Blog! This is an overwhelming giveaway! There are over 75 products to win! The prizes are broken down into 5 giveaways. You can enter one or all 5 giveaways. My donation is in Giveaway # 3. The product I donated to the giveaway is my Penguin Addition Doubles Plus 1 Math Game. This activity aligns with the Common Core Math Standards. You can learn more about my donation by clicking the picture below. Here a picture and list of all the prizes in set # 3. To see ALL the other prizes and to ENTER the giveaway, just CLICK on the TOP picture. Good Luck! I hope you win lots of wonderful teaching resources. Head over to her blog to add in your products or to download some fabulous, free, fun resources. Are your students studying about animals? Here's a little Reptile Word Search Puzzle. Students have to find the names of 11 different types of reptiles in the word search. You can find this free puzzle (and others) at my website. Just click on the link below. Here's a link to an earlier post about reptiles that includes their characteristics, list of books, and a craft idea. If you want to hear what Bill Nye has to say about reptiles, click on the link below. Are you working on Odd and Even Numbers in math with your children/students. If you are, then I want to share with you two posters and two students worksheets that you can use with the children. The posters and worksheets can be found at my website. Just click on the link below to grab your freebies. You might also find other fun freebies while there. Kyp at Mrs. McLaren's Little Super Stars is having wonderful giveaway. She is donating $25 from her Teachers pay Teachers Store plus 27 other educators are also donating teaching resources. I am donating my Valentine's Day Addition with Doubles Game for students in Grades1-3. If you would like to learn more about my game, just click on the picture directly above. To see the list of prizes and to enter the giveaway, click on the top picture. Are you teaching a science unit on MAGNETISM? Here's a fun freebie! It's a MAGNETISM WORD SEARCH PUZZLE. This puzzle can be found on my website along with LOTS of other science freebies. Just click on the link below to grab your free word search. Also, here's a link to a fun science experiment with magnets and the 3 types of matter. I hope everyone is enjoying the new year. Today I just want to remind you that I have LOTS of FREE Worksheets for you to use with kids from PreK to Grade 8. Most of my worksheets were on one page at my website (Learning Workroom) but I have recently divided up the worksheets and now use three pages on the website. I think this will make it much easier for you to find what you need. So please visit my website at your convenience and download some free, fun worksheets! Click on the link below or any of the pictures above.